Our 50 comfortable double and single rooms and one room for handicapped persons (all are non-smoking rooms) vary in view and size. 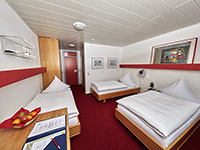 We have rooms furnished in the Bauhaus style and classical rooms. All of them have shower, WC, hair dryer, phone, tea facilities, Wifi, flat screen TV and balcony. All single and double rooms are equipped with a fridge. 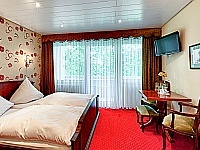 From some of our rooms you enjoy a beautiful view over the Rhine valley. Special prices or company rates are available on request.